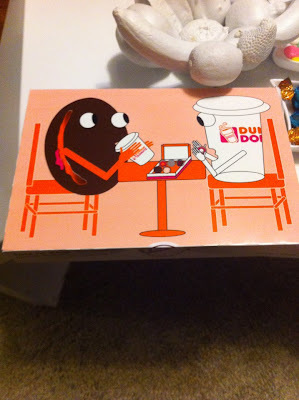 This is the cover of the Dunkin Donuts box when you buy a half dozen donuts... I think it was made by like some amazing computer program that by some bizarro series of calculations figured out how to make art for humans. 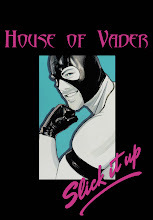 I think this because it somehow makes sense, yet is also full of bizarro flaws and flawless corporate logo placement. Like is it a doughnut talking to a cup of coffee? If so what is that slice running down the side which makes it look more like a burger? The jelly was clearly added to ensure that, YES, indeed this is a doughnut. The line on the bottom of the cup is not necessary but is there to show you that yes, indeed this is a cup. The doughnuts arm doesnt have a line border but the cups does ... How did they get on the chairs with no legs?... Are they handicapped? Because they have arms but no legs.. is that some kind of unconscious way of telling us as consumers that these products cant runaway and we should then eat them because theyre easy prey??? I think making him a jelly doughnut made it easier to create an eating pose that matches the Cup Man's for theme and symmetry purposes. If it was a cake doughnut character with a typical HUGE HOLE for a center, it would have been tough to locate a mouth for him that allows him to match the Cup Man's pose, which has to match ours, to force the observer to contemplate the disturbing cycle of consumption going on. I love hearing your thought process about this illustration, David. I think that it looks like they are having a VERY intense conversation. Plus, the cup's "mouth" looks like someone took a bit out of the side of him. I am so glad you share your kookery with us! And most fucked up of all: the coffee is eating a doughnut and the doughnut is drinking a coffee. Their relationship is clearly fraught with passive aggression. And then there's the whole cannibalism theme, with Mr. Donut consuming his dining partner and Mr. Cup Man eating donut balls. It's disturbing on so many levels. The "donut" on the left looks a bit like a bloody pumpernickel bagel to me (or is that strawberry cream cheese?) AND HOW DID THEY GET IN THOSE CHAIRES?!? I am sorry --- I can't get past the excited looking white arrangement at the upper right corner. Looks like it was removed from the guy in the white paint in the other photo. I think it's a jelly doughnut, Jim, because it's within the context of Dunkin' Donuts. Do they serve bagels? What are they more famous for?